@MRC admins: wouldn't it be a good idea to open a forum dedicated to the V9990? Quite a lot of discussions going on lately about this video display processor + it would be a good place to encourage developers to create software for it. I sign up for the forum. Lately I am testing the different bitmap modes. Up! What's the admins' opinion on this? +1 for the dedicated forum. For me, here is also good. That's not a forum, it is just a thread. Can we get a forum for 16kb RAM MSX1 without engine, without external hardware, with mono sound output only, cvbs out connected to crt and right cursor keys sticks? V9990 finally has momentum, so I understand Ivan his proposal. Might give it another boost! I can comment on these roms. I'm not sure what this would achieve, i mean, if lots of people were asking lots of V9990 questions, then it would make sense, but is there that much activity? 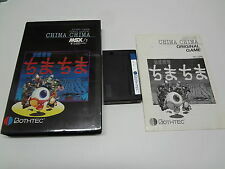 And, ChibiAkumas supports V9K and regular MSX2 - so would I post it in both forums? or just one? - Either answer seems wrong to me! @keith56: On the v9990 forum you just ask questions/talk about details of the v9990.